Zhang Guo Ning (b. 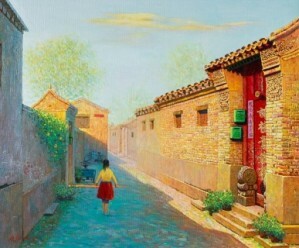 1960, Beijing) has dedicated his life and art to capture the cultural beauty and historical charm of the hutongs (alleys) and siheyuans (courtyard houses) of Old Beijing in China after his own ancestral home, passed down for four generations and where he had lived for more than 35 years, was torn down in 2001 to make way for new development. In his paintings, Zhang romanticises the hutongs by restoring their glory through vivid colours and fine detailing of intricate carvings. He also reminisces about his own childhood with the portrayal of children, bicycles, birdcages and letterboxes. The couplets on the houses’ distinct red doors convey traditional Chinese values and blessings to the households and their generations after.